Gran Canaria: PADI Referral Courses in warm waters. Complete your PADI Course or Referral in Warm Waters! Can I do my PADI Course Referral in Gran Canaria? The PADI training system allows you to start a course with one instructor, and complete it with another. You can undertake the confined (pool) water training for a PADI Open Water course at home in Northern Europe, and do the open water dives here in the warm waters of Gran Canaria. Our waters are warmed by the Gulf Stream and in late summer reach a pleasant 24ºC while in winter rarely drop below 18ºC. You can grab a short-break bargain to the Canaries and in a couple of days get some winter sun and complete your PADI course, and avoid cold quarries, drysuits and the poor visibility found in most of the winter diving sites in northern europe. You just need to request a 'referral' form from your PADI instructor, on which he will list the elements you have already completed and bring it to us to get your course completed. So if you do not fancy the prospect of getting 'stoney cold', diving in UK waters in winter with temperatures of about 3 to 4 degrees, then why not pop down to the Canaries for a few days ? With low cost airlines such as Ryanair and Easyjet now coming to the island several times a week; or a combination of Thursday/Monday flights with one of the major tour operators such as Thomas Cook, you take take a short break to Gran Canaria, complete your Open Water Course in the sunshine and warm waters of the Canaries. Even in winter the water temperature rarely drops below 18ºC, and visibility is usually around ten to fifteen meters!. If you weigh up the costs of diving in the UK with special hire of dry-suits and other cold water protection, the high cost of overnight accommodation near many inland sites, and UK travel costs, you may be surprised how little difference there is in cost; yet the difference in experience is incredible. Diving among clouds of colourful fish in clear warm water helps build skills more rapidly and will build your confidence as well. Find out more about PADI Referrals at Go-Warm.com! Which PADI Courses can be Referred? All PADI courses are eligible for referral, so if you are taking any course and get prevented from compldting the last dive or dives (for example by bad weather, ear problems, boats not operating or no-fly restrictions) then we can complete those dives with you here in Gran Canaria and issue your PADI Qualification. You can take any combination of unfinished components from your PADI training course, including confined water, open water dives, tests, knowledge reviews etc. By far the most popular type of referral is to complete your PADI Open Water course in two parts, and do the confined water near to your home, and come to the sunshine of the Canaries to do the open water dives in warm water. Your base where you will complete your PADI course is 'Casa Limon' in Arinaga, which has an enclosed, shady garden where you can relax while your instructor gets you ready for diving. In 'Casa Limon' you can make yourself a drink, snack in the garden, get changed in privacy and comfort, and use other facilities such as the toilets, shower and free wi-fi. With more space, more facilities and more atmosphere than any other dive centre in Gran Canaria it is no wonder our customer feedback and scores won us three 'TripAdviser Certificates of Excellence' in 2014, 2015 and 2016. And if English is not your first language, between us can also talk you through the briefing in Spanish, German, Dutch and Italian. Will I be safe with Davy Jones Diving? Safety is part of our culture, and is part of everything we do. By assessing all the risks carefully we have planned safety into each step. For this experience for beginners there are many aspects to keeping you safe, from the equipment we use, through the low ratios of instructor to students, to the use of a very safe area for the diving which has plenty of marine life to thrill any beginner. 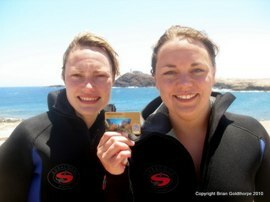 Over the last fourteen years over a thousand people have safely taken this PADI courses with us. If you have any concerns about safety then please do not hesitate to voice them, and we will be delighted to explain how we keep our accident rate minimal. When diving in Spain, the laws require that every diver is covered by both suitable medical insurance and a type of 3rd party insurance called 'responsibilidad civil'. To guard against any potential problem, we have organised a specialist policy with a Spanish Insurer which guarantees to cover all medical and Spanish legal issues for every single PADI Scuba DIver or Open Water course that we teach. So rest assured, you do not need to dig out that policy and check it word for word before you learn to dive .. we've already got you covered. Free use of Dive Computers! PADI now recommend that all students on Open Water courses get to use a dive computer as part of their training. The dive computer monitors depth and duration constantly, and calculates a remaining dive time to avoid decompression illness, and helps monitor ascent rates. 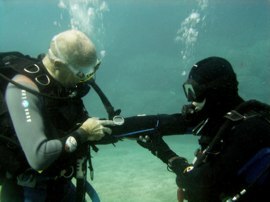 Using a dive computer properly contributes to increased diver safety and more enjoyable dives. At Davy Jones Diving, we include the use of the Dive Computer for part of your Open Water Course Free of Charge, so you can understand how they work and how they can help you manage your dives. You get more from your PADI Course with Davy Jones - Where else do you get all this on your PADI Referral Course? You get to dive and explore the Playa del Cabrón (one of the best dive sites in Gran Canaria) under the watchful eyes of an experienced PADI Instructor. Your Referral course normally includes all the diving equipment you need, including dive computers, and free drinks in 'Casa Limon' the PADI Five Star Diving centre in Gran Canaria with a Tripadviser Award for Excellence. You will be picked up at your hotel in the morning and returned in mid-afternoon with a big smile on your face! You are fully covered by our insurance for both rsponsibilidad civil and medical costs on Scuba Diver and Open Water referral courses. You will find out how it feels to swim weightless among hundreds of small colourful fish. If you complete all the performance requirements for your course with us, we will complete the certification documentation for you, and you will be awarded you qualification. Exact pricing will depend upon the elements to be completed. Please contact us and we can work out an individual price for you to gain your PADI qualification. We like to keep our courses small, so we only have a maximum of four students per instructor on a course. As this course is usually very easy to timetable, we can offer this to individuals on their own. This means you get great personal attention, and helps to keep the course timetable short and maximises the instructor involvement during your course. We can also support junior divers through the referral process, however we cannot support unaccompanied minors. Our page on PADI Junior Courses gives more details about Junior PADI Courses and diving in Gran Canaria for divers with Junior qualifications. A student who is over 10 and under 15 can follow the normal syllabus and if they complete all the requirements of the course they will be qualified as a PADI Scuba Diver or PADI Junior Open Water Diver depending on the course they select. We collect you from your hotel for your referral course at around 9.00am. We do two dives each day, the first around 10.30 and the second around 13.00, with a break in the dive centre between the dives. We aim to return you to your hotel in mid-afternoon. All transfers included. The course usually has two days of diving for an Open Water referral, and one to two days for a PADI Scuba Diver or PADI Advanced referral. Timetabled to suit any other holiday or partner commitments and availability of special dives (eg boat dives).